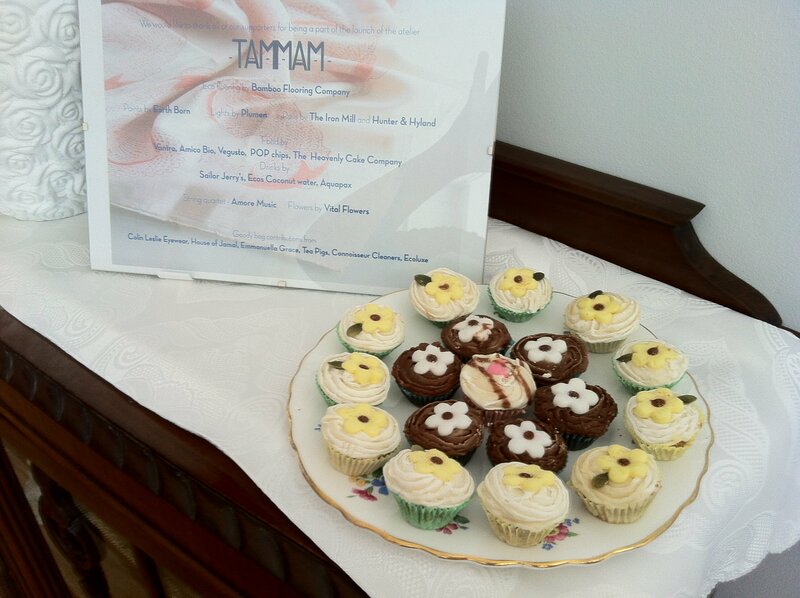 Today I would like to talk about some of the wonderful companies who have supplied gourmet delights to tantalize our taste buds at Atelier Tammam events. 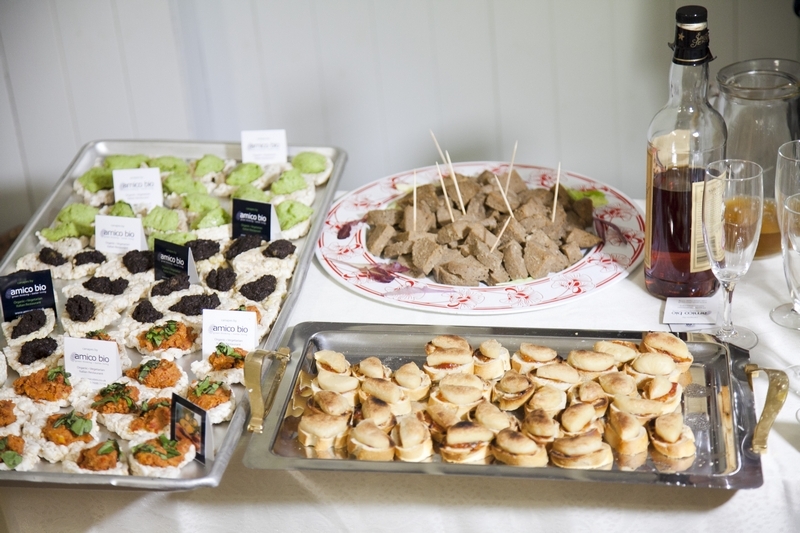 We make sure food at our events is vegan, and if possible, local, sustainable and organic. For the Atelier launch 2 of London’s top vegetarian restaurants supplied us with the most delicious organic vegan canepes. 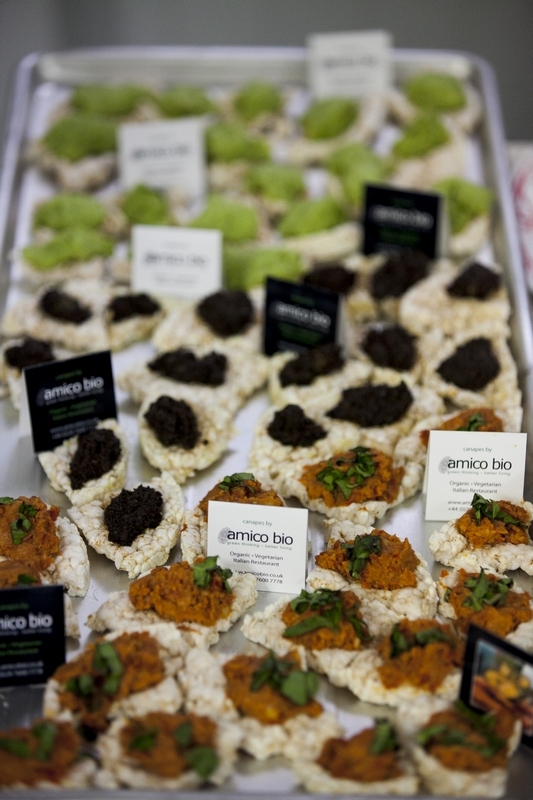 The tricolor rice cake offerings from Amico Bio went down a treat with our guests and the delicious raw pizza bites from Vantra were so incredibly delicious, covered in raw vegan “cheese” spread and fresh veg sprinkles on a hand made cracker base of seeds and spices. SCRUMPTIOUS. We also had some of the award winning vegan “cheese” from Vegusto, we whipped up some toast bites with tomato relish and “No Moo Melty” and served the block cheese cubed along with mounds of fake-meat on cocktail sticks. 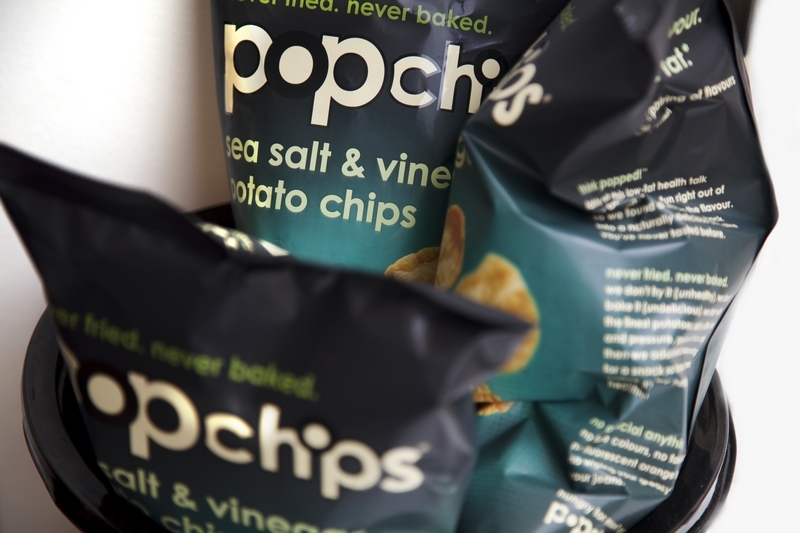 Accompanied by Popchips (Salt & pepper -my Popchip of preference, original and sea salt & vinegar) guilt free crisps. The wonderful bakers at The Heavenly Cake Company made us delightful bite sized vegan cakes that were so delicious and looked delightful too. Of course no party is complete without a tipple or two. We created a special cocktail for the launch, with a little help from the lovely Louis at Sailor Jerry. 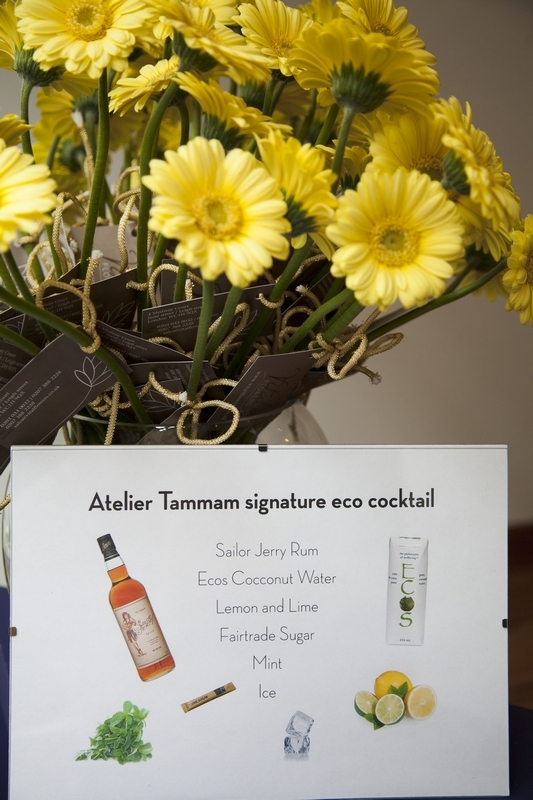 The Atelier Tammam cocktail is an exotic blend of (Vegan) Sailor Jerry’s Rum, lemon and lime, mint, fair trade sugar – muddled and poured over ice, topped off with a generous glug of the premier coconut water Ecos – which of course is also delightful unaccompanied. I do like the version with Rum though….. I am very excited that the wonderful people at Conscious Chocolates are sending us some of their best selling essential orange chocolate for guests at our Fashion Night Out event next week to sample. 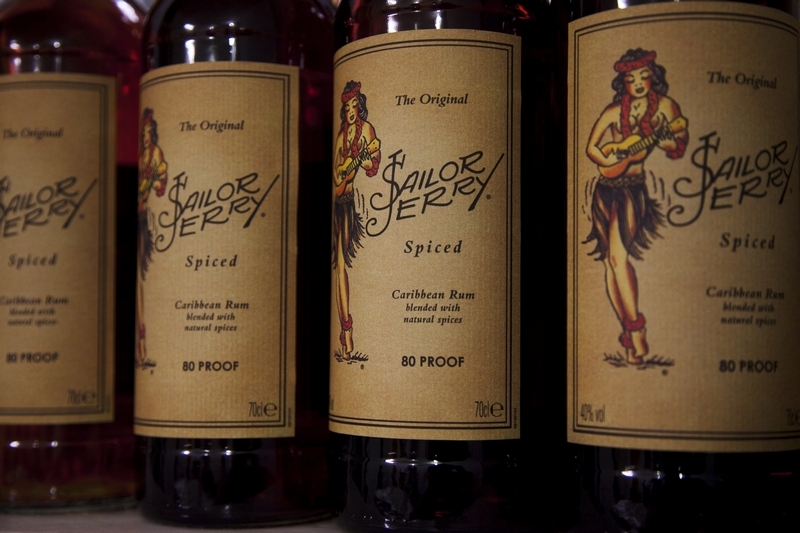 PopChips and Sailor Jerry will be there too, so why not come and try? 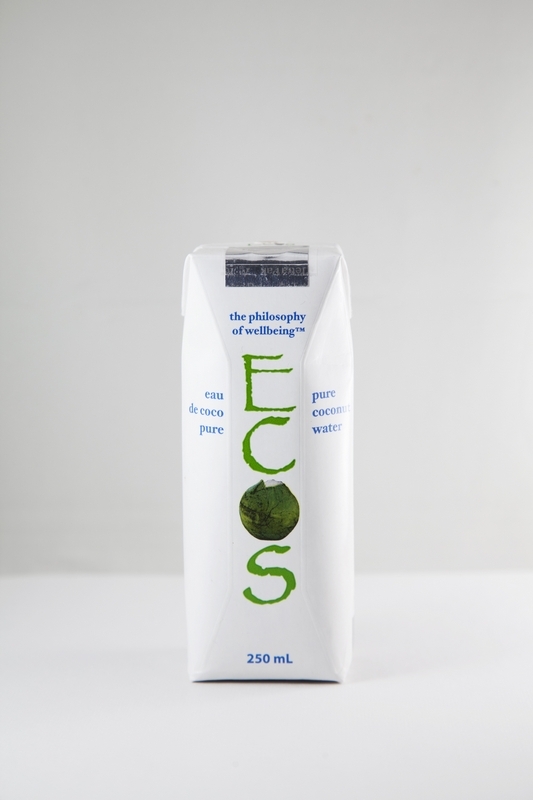 I’d like to say an enormous THANK YOU to all the wonderful companies who provide refreshments for our events, for pandering to our whims and creating vegan, sustainable and delicious treats for me (and my guests if they are quick enough) to scoff…… I highly recommend all of the companies above. September is a busy month for Atelier Tammam. Not only do we have London Fashion Week to prepare for, we also have two very exciting events before hand. 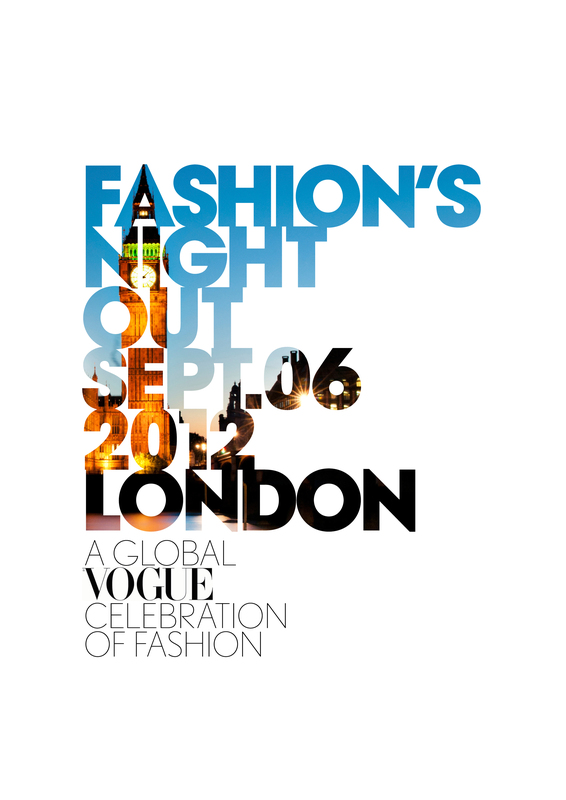 The first is our 1st annual Vogue Fashion’s Night Out event. Most of the events for FNO happen in Covent Garden and around Bond street, so we are hosting an early bird event for people to attend on their way. The wonderful people at eco-taxi company Green Tomato Cars are offering our guests a discount shuttle service in to the main events so you have no excuses! On the night you can have a mini hair or makeup make over at Suedey Salon just up the road, get styling advice, alterations and of course buy some exclusive pieces from Tammam and Who Made Your Nickers to help accessorise your Fashion Night Out. Complimentary Sailor Jerry’s and PopChips as well. Too many reasons to come! And for our more wedding focused customers, that very same weekend you are invited to Atelier Tammam’s first ever Luxury Bride Sample Sale featuring designers supplying every aspect of your wedding outfit – dresses, veils, shoes, jewellery, undies and even perfume. Plus the gorgeous Nanna from Splendid Stitches will be on hand for any alterations needs. We’ll have complimentary cakes by the infamous GC Couture (including vegan options), nibbles and drinks. I hope to see you at the atelier for one (or some) of our spectacular September showcases. 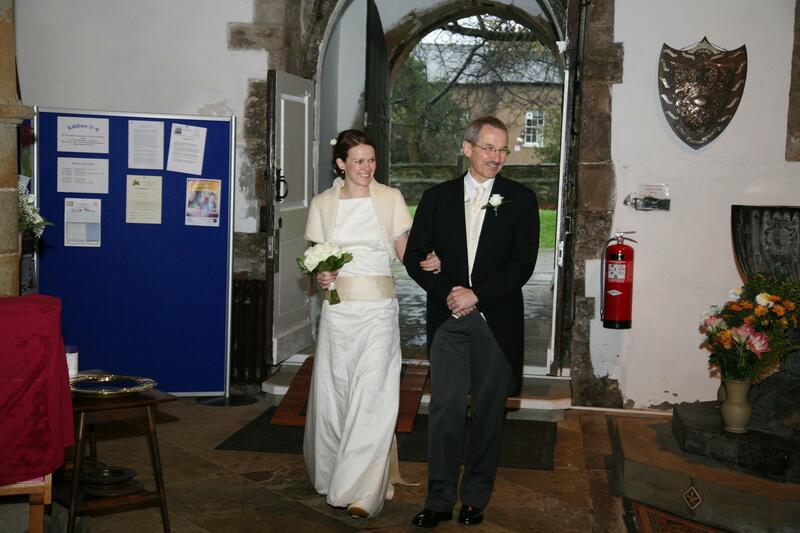 Last week I got an email from a lovely bride in the US who bought an Abbie dress from the Tammam White ready to wear collection a few months ago. 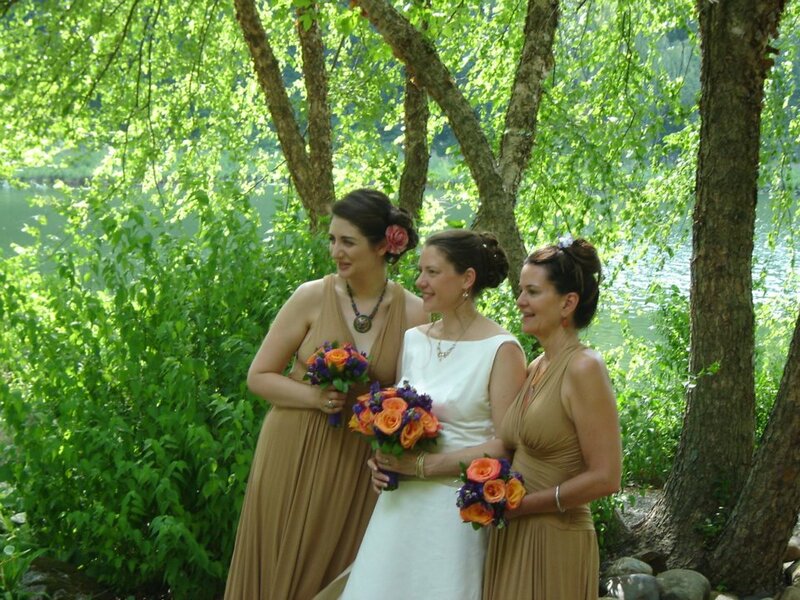 It was lovely to receive a beautiful heartfelt note and see the pictures of Lisa in her dress on her wedding day. The Abbie dress is one of our best sellers, for its versatility, simplicity and timeless quality. 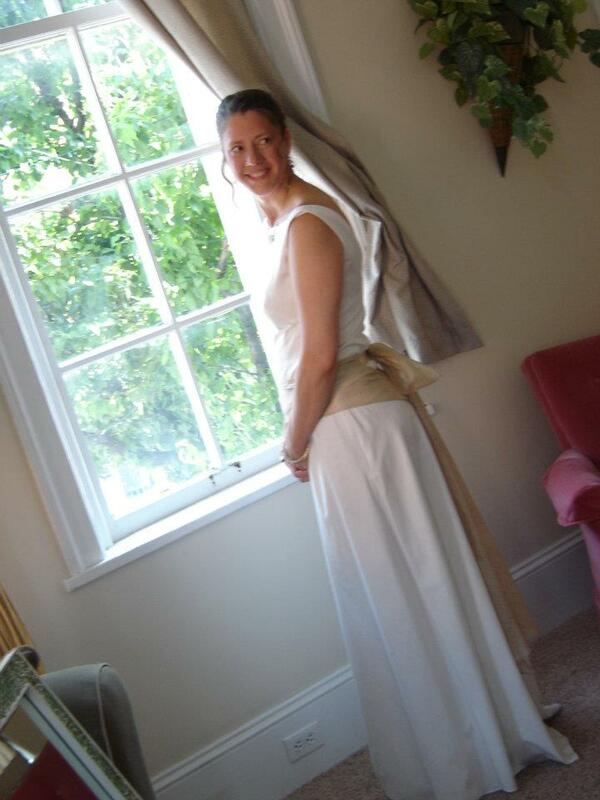 Lisa also wrote “Thank you again Lucy for your amazing design- It was my dream wedding dress come true!” It was my pleasure Lisa, it is one of the great joys of my job to see beautiful people getting so much happiness from our gowns. The Abbie dress is available, along with the rest of the Tammam White ready to wear and Lucina Puro accessories collections, from our brand new webshop. Which once again makes me wonder why we have the atelier….. never fear my next post will detail, and invite you to, 2 upcoming events that would not be possible without our lovely little boutique…. I am going to show my age here, but isn’t the internet wonderful?! It has made the world seem so much smaller. It means we are never more than a video call or email away from our producers, suppliers and retailers and recently it has helped us create a bespoke gown for a client in Australia. 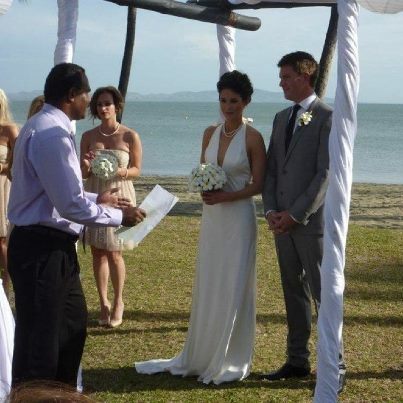 The gorgeous, if somewhat carefree, Vicki is originally a Londoner, she loves our ethos and adored our designs, so a Tammam gown was the only option for her special day, which was in Fiji a few weeks ago (unfortunately I didn’t go). Vicki lives in Australia and was not planning to visit London at all before her big day which meant every fitting, all designing and planning had to be done via skype. Vicki decided on a few gowns she liked and the samples were sent off with her Mother on a trip late last year for her to try while I watched, unable to assist, from our London studio early one morning. 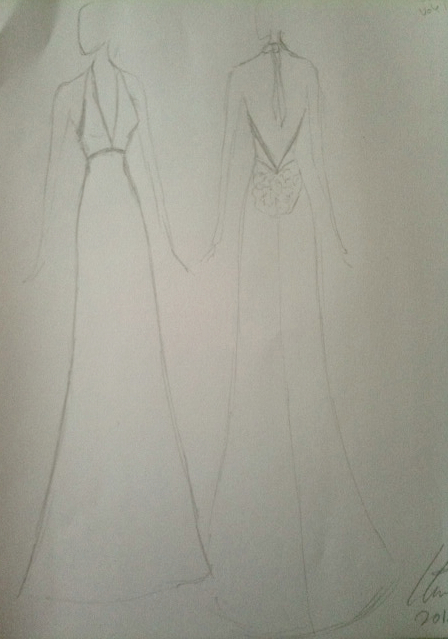 We deliberated over the designs and concluded that the Sophie dress and Kat dress were both gorgeous for her. After a little more discussion we talked about a bespoke design to incorporate the favourite bits of each dress, using a piece of vintage lace (something old covered) and I went away to draw up the design, which was emailed over later that week. As soon as this was given the go-ahead the next job was to take the measurements. A skype call was arranged and we both sat in intense concentration as she took each measurement 3 times under my watchful eye to ensure we had it right. 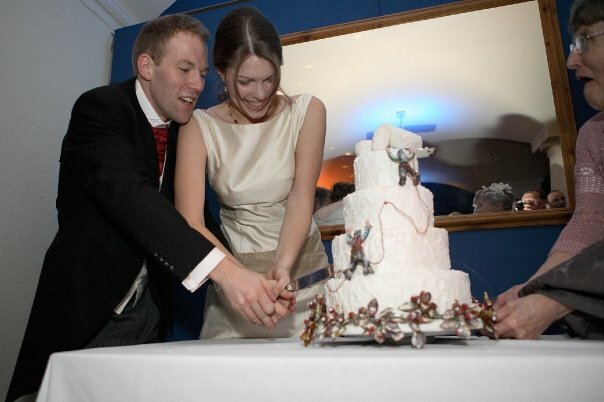 Taking measurements correctly is essential to ensuring a dress is a good fit and does not need too much altering after being made, and is something I take great care over – when I have control of the tape measure…. I then set about drafting the pattern and creating a toile (fabric mock up). We use organic fair trade cotton voile (or canvas for more structured designs) to make our toiles, which help us ensure the fit of the dress is perfect and the cut is correct before creating the final gown. The toile then got sent, via the post office, to Australia and we waited for it to arrive. And we waited, and waited until finally there was no time left and I had to remake the toile and courier it to arrive before I left the fair trade producers in Bangalore who were going to be making the dress. For all bespoke dresses we work very closely with our skilled and well trained tailors in India (and Nepal) to make sure they understand the design and use the correct techniques, fabrics and methods. This means I spend a lot of time in India and each visit is packed with orders, and precisely scheduled, to make the most of always limited time. Thankfully the couriered dress arrived, the day after the parcel force one (yes a delivered “within” 10 days package took 6 weeks to arrive) and even more thankfully the toile(s) fit very well (triple checking measurements paid off) and after a quick skype call fitting and checking thoroughly, the slight pattern adjustments were made and the dress was cut the next day, in beautiful peace silk crepe. Our fabulous tailors stitched the dress to perfection and our embroideress Amu (who I will blog about another time) attached the delicate vintage lace panel by hand, in the traditional couture fashion. Off it went to Vicki ready for her wonderful beach side wedding. It makes me wonder rather why we bothered to open the atelier after all!